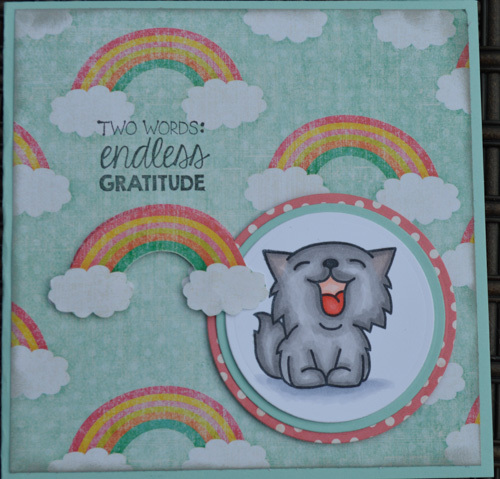 This month’s challenge at Paper Smooches is Rainbows. Sandra sent me a card for the Simon Says Wednesday challenge. I thought I would post it quickly before I run out to work. I had a couple of pictures of my granddaughters Kylie and Taya that I thought were just plain lovely and deserved to have a scrapbook page to show them off. I was also surprised to realize that I had everything I needed in my stash to produce a layout using lavender as the primary colour. I remembered that I had picked up some lovely Prima flowers in shades of purple when they went on sale, because I knew this colour was a favourite of Kylie. I had recently received the Downton Abbey Scrapbook Kit, and the lavender papers in it had just the right feel and touch of elegance for the project. I am happy enough with the results that I think I will be purchasing a shadow box frame, so that I can put it on my wall. Supplies: Crafter’s Companion Downton Abbey Papercrafting Collection. Prima Flowers and gold doilies, Papertrey ink What the Doodle Feathers and Butterflies stamps and dies, May Arts heart ribbon, unknown pearl lace, Kaleidoscope embossing powder, Deco Foil gold, copic markers, Zva Creative pearls, Darice Ostrich feather, Tombow tape runner and many pop up relief glue dots. The theme for this month’s challenge at Paper Smooches is rainbows. I often find that Paper Smooches images look best on CAS cards with lots of white space. 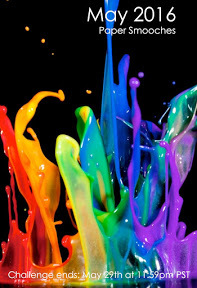 That is good, as this is one of my favorite styles. The challenge for me is making something distinct from other cards while remaining CAS. I need to add to my stash of Paper Smooches stamps for sure as most did not lend themselves to a rainbow theme. At least at first glance it seemed like this, but I found something that would work and off I went to put something together. Using a rainbow always makes me happy, but the other thing that made me happy in making this card was the fact that I used my Tim Holtz distress crayons for something other than just testing them out. Yay! The Monday Challenge this week is to use felt on a project. I have just bought some wonderful felt both from Simon Says Stamp and from Papertrey Ink. What a difference quality makes. The felt I had previously was barely acceptable for my Grade 4 Popsicle stick project and here I was still trying to use it several decades later. In fact, I had tried to use this exact die with the cheap see through felt and it had gone all Mission Impossible on me and self destructed. Not this time though. Although I am not crazy about the background paper, it was the best of several I tried from plain white and woodgrain, to polka dotted. I keep re-discovering some stamp sets that had found their way to the bottom of the stamp pile due to their finicky ways. With the Misti though, I can now manage finicky stamps and make them work. Such is true of the sentiment stamp on this card. With the Misti I managed to emboss the ribbon, stamp three different sentiments after bending them to the shape of the ribbon and finally die cut them out. So the Make it Monday challenge at Papertrey Ink was to use money on a project. The samples made by Lexi included the art of Origami. This really intrigued me as one of my now grown up sons (sort of LOL) used to be the Origami King in the house. There was always Origami frogs hopping and Origami birds flying all over, which usually ended up stuck in my vacuum hose (yes, I used to do this!). Turns out this challenge was fraught with peril. First of all, I am Canadian and our money is now made out of plastic which does not fold well at all (by design). Luckily for me I had some US dollar bills left over from Phoenix (leftover money…….who am I kidding!). Anyway on with the challenge. I decided to use the design from the Papertrey Ink Love you to Pieces paper pack along with the patterned paper from the Shakers and Sprinkles Kit.to make the money holder. That worked quite well. After that I went on the internet to get a lesson on how to make a heart out of a dollar bill. Well, several tries later my lone dollar bill had fold lines going every possible way. In the end, I had to use my only other US bill which was a $20 to make the heart. Finally the project was complete. Then I ran into the next problem. I wanted to fix my photo of the card a bit in my photoshop program. A pop up window came up reminding me that nasty things can happen when you attempt to copy money and that my application would take no part in it. So, here is my challenge entry unedited. I am quite sure that no one would accept a heart shaped bill as legal tender. At least I would hope not. It really does work well to use the Papertrey Ink heart zipper die for a money gift card. I did not tape the inside down as I desperately need that $50.00 bill for groceries, but if I were ready to give this card I would tape it all down. No chance of the money falling out and the card recipient gets to unzip the front and discover even more money inside. I mean who would not want a gift like that. I did eventually fold a Canadian bill into a heart shape as well, but it took multiple pieces of Micropore tape on the back to hold it together. It will take some delicate peeling to get it all off. I think I will give it to my Origami frog maker son as payback for my clogged vacuum.